Once again, I don't have anything new on my wall. But I have plans...... oh boy, do I have plans. I've finally decided on the project that I'm going to celebrate the New Year by starting. In fact, I might start it tomorrow, and celebrate the end of the old and the beginning of the new with a new quilt. Judy Martin, and the book is called Scraps. I have tons of 1 1/2 inch strips left over from various projects that will work in this quilt. I'll be using Kona Ash as the background, which is what these strips below are draped over. This should get me well on the way to using up some of the overflowing bins of scraps I have hanging around here. The picture of the quilt shown here is only 52 by 52. I will, of course, be doing a bigger version, probably the queen sized. This might end up belonging to Matt and Becca, since they painted their bedroom grey not long ago, and have dark grey curtains in there, as well. 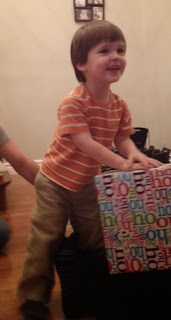 But as for the rest of today, this darling little boy is visiting us. He's down for a nap right now, which is why I have the time to write this. But once he wakes up, we'll be heading out to an indoor play place. I'm hoping, by this time next week, there will actually be something to show on one very neglected design wall. The last stash report of the year. A time for reflection and comparisons on years past, and plans for the year to come. That sounded rather profound, didn't it? Balance: 54.6 more yards in than out. I've been keeping track of the stash for 3 full years now, and it is kinda fun to compare from year to year. So, it would seem that my usage numbers are going down, while my added numbers are going up. However, the overall goal for the next year, is to use what I have. The exception to that will be, if I need background fabric for a specific quilt that can't be done with amounts I have on hand. The other exception will be for sales that are too good to pass up in order to refresh elements of the stash. 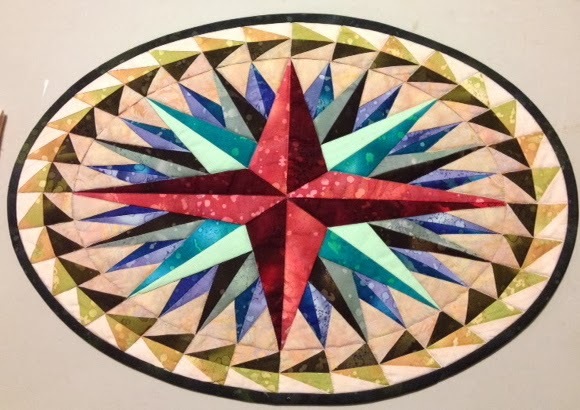 I'm not going to make a firm no other buying commitment, because quilting is something I love, and I don't want to take any of the joy or fun from it by putting unrealistic expectations on it. 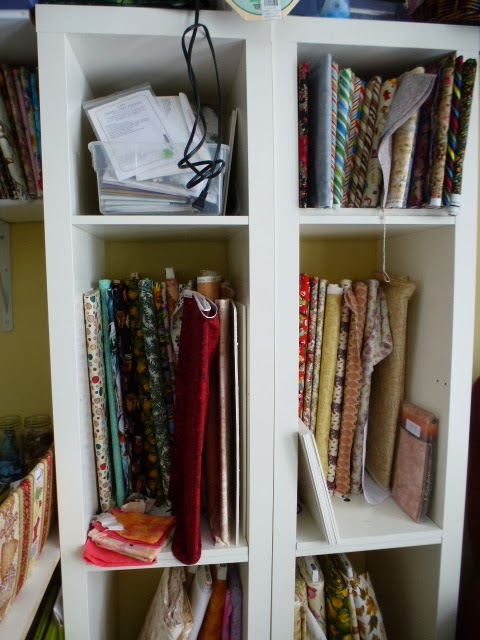 But, I do know that, since both my husband and I are retired, the amount of cash I have for fabric has gone down, so I will have to be very careful and thoughtful about what I do buy. All of the quilts that I have listed in my side bar for wanting to do this year, can mostly be done from stash. And, I have so far resisted all of the very tempting year end sales of fabric. So, that means, I'll start off the New Year with a negative balance. And now, I'm going to link this up to Judy's Stash Report, and then I have stuff for Avery for Christmas that I have to finish. And, considering they are coming today.... yippee!..... I had better get a move on. So, here it is, the time to look back and see what exactly got accomplished this year. The first thing I noticed on looking back, was my disregard for proper post labels. I didn't put "finish 2013" labels on my finishes. So I had to go through my label list and find the things I finished this year. Sadly, there weren't all that many complete finishes. But, I guess with the move, and all the chaos attending that, it was amazing that I got anything finished. I started lots of things, but only finished five. 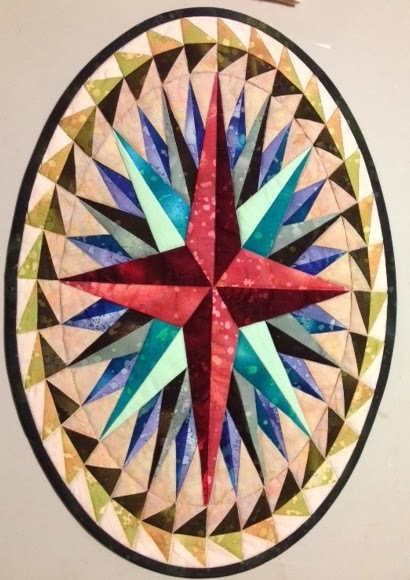 Road to Brenham, a free pattern quilt along from Patchwork Times. My Dresden Plate, from a quilt along from several years ago. Endless Chain, a pattern by Emilie Richards. My plan for the coming year, is to have a year of finishes. I'm going to make a couple of lists for the right hand side bar of the blog. One will be for quilt top UFO's that need to be finished. The other will be for quilt tops that are waiting for quilting. Maybe with these lists staring at me, and reminding me, I'll be able to get them done. I'm also going to join in on the 2014 Lovely Year of Finishes sponsored by the blog Sew BitterSweet Designs. I found that, in the years before when I've joined in a UFO finish challenge, I've done much better in getting things done. 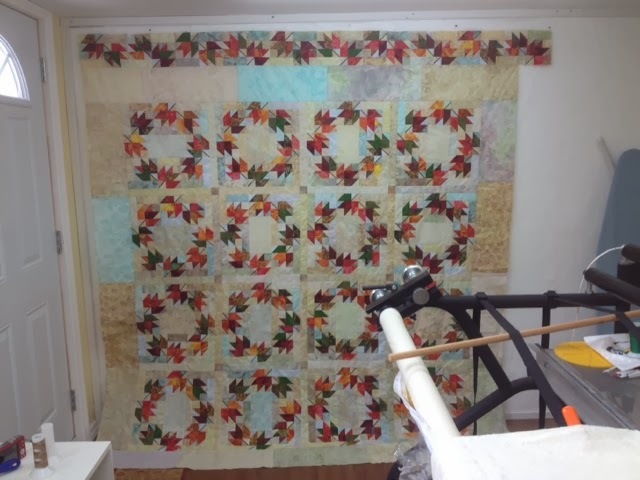 The other thing I think I'll do, is schedule my own quilts in with the customer quilts, maybe one a month, or every other month, so that they can get done. So, that's it. Now, to get those side bar lists done. I've made good progress on my Cowlie project this past week. I had all kinds of plans for getting things accomplished yesterday. I was going to lay out and then cut the pattern pieces out for Avery's pajamas, but my back had other things in mind. The muscles in between my shoulder blades decided to spasm, they've done this before, so the first part of the day was spent with a heating pad on my upper back, and the rest of the day was spent relaxing, and doing some knitting, since that didn't pull on those muscles. They're better today. I'm looking forward to getting this Cowlie done, since one of the things I want to do in the New Year, is start getting out walking again for some exercise, and I'll need this warm snugly head covering to do that. There is a special treatment that goes around the front edge, and I'm not sure how much yarn that's going to take, so I think I'll start on it next, since that ball of yarn in the left of the picture is all I have left. If I have any left after doing the front edge, I'll do more on the bottom ribbing section and then bind that off. The front edge actually folds back, so it doesn't end up as big as it looks here. If I continue with this today, I just might be able to finish it. I've been thinking about next years' projects, both quilting and knitting, and I think I'll start doing the same thing with knitting as I do with quilting. As a project is started and blogged about, I'll label it with the name of the project, and the date so it shows up on the blog and I can track what I've started and finished for the year. I think in the past year I did six pairs of socks, plus the Dreambird Shawl, three hats and one scarf and a baby sweater and Avery's Truck sweater and the Bunny Balaclava for Avery. But, if I'd labeled them here on the blog, I'd know for sure exactly what was started and finished. Another Monday, another week without anything new on the design wall. :( But, I have been working on a project, and long overdue, badly needed project. 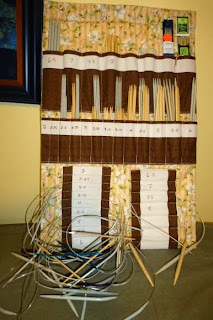 A place to centralize and organize all of my circular and double pointed knitting needles. I spent a lot of time yesterday browsing pinterest pages for organization idea for these things. I really dislike the roll up things. I wanted something where they could be out where I could see them, and get at them, but out of the way at the same time. Up until now, my needles have been scattered all over the place, in various bags and drawers, resulting in my not knowing what sizes I had or didn't have, and that would end up in me buying more, since I had no idea what I had and where they were, if I did have them. That problem only got worse after we moved. After we moved, since I couldn't find most of my needles, I've slowly been replacing them with the bamboo wood ones when I order more. I like how light weight they are, and the fact that they don't slide out of the working stitches. And for some reason, they seem to be easier on the hands and fingers to work with, as well. So, here they all are, the ones I have found so far, at least, in their labelled spots, with the circulars hanging from labelled insert things. While I was at it, I went through all the projects that were in various stages, and discovered that there really aren't that many of them. I have a baby sweater that I found that just needs a sleeve finished, a pair of socks that need the toes grafted, and the rest of the projects are all current ones. So, this needle holder contraption is going to live on the side of the shelving unit, right beside my chair. And, hopefully, I will never have to go searching for the right sized needle again. Wow, is it ever hard to believe that there is only one more stash report for this year! This week's is easy.... nothing in and nothing out. Lots of time spent finishing deadline quilts for customers, and then lots of baking and lots of shopping and lots of finishing up other gifts, none of which can be shown. Doesn't make for a very interesting blog post, though. The best thing that has happened in the last couple of days is that our son Noel is home for Christmas. Yippee!!! He picked a good time to travel, yesterday morning, in between two winter storms of freezing rain in our area of the country. Thankfully, we actually didn't get much of the freezing stuff where we are, just plain rain. I've been thinking a little bit lately, about plans for next year. I am going to continue with the stash reports, but am going to concentrate more on using what I have, whenever possible. I want to concentrate on using up the boxes and bins and heaps of scraps and stings and crumbs that I have hanging around here, taking up space. I'm starting to feel really overwhelmed by all the stuff I have, so it's time to use some of it up. So, I think that will be my focus for the next year, and I'll mostly use that focus for deciding what projects to start. This is my poor little cutting table. It's gotten to the point where there is no table top left to cut on. I have got to set aside some time in the next while to do something about this, or I won't be doing anything. That pile on the back left hand side of the table is all scraps that need to be sorted and either put into their appropriate sized bins, or cut into sizes to go into those bins.So, as I go forward, I'm going to be thinking about the projects that I want to do, in order to decide what sizes to cut. In the meantime, here are the numbers, unchanged from last week. Balance: 55.4 more yards in than out. So, from here on, the search for next years' scrap busting projects begins. Pinterest, here I come. I'm linking up to Judy's Stash Report. 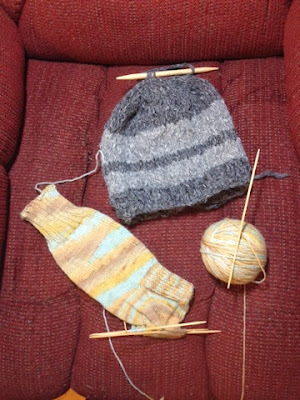 I've done it again, and here it is Saturday, And I'm doing Friday's knitting post. But there's something about this time of year that makes my already bad procrastinating habit even worse. I finished up all the customer quilts that needed to be done before Christmas on this past Wednesday. Since then, there have been lots of grocery shopping trips, optometrist appointments, stocking stuffer shopping trips, and pajama pattern tracing, then pajama cutting out and pajama sewing. One pair is completely finished. I did manage during all the driving around, to get some knitting done, and am making good progress on my Cowlie. There is a treatment for the front of this piece once all the rest of it is done, and I really hope it does something about folding the front part back a bit, because right now it is really long and hangs over my face. It's the right gauge, so I'll just have to wait and see what developes from here. I've started the ribbing shaping for the transition from going horizontal to vertical. 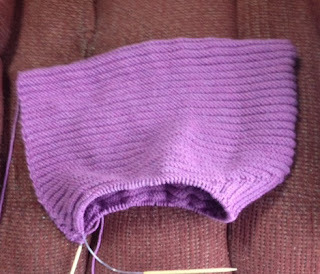 After that is done, it gets joined at the front, and then knit in the round to form the cowl neck part. It's a pretty fast and easy knit. And I learned something new doing it, the magic loop cast on. I like learning new stuff. The rest of the time yesterday was spent baking. My wonderful husband has been expressing a desire lately to learn how to make pie crust. Yesterday was the day. He made 4 dozen mincemeat tarts. By the time he got to the second batch of tarts, he was getting there. By the last dozen, he had it nailed. While he was doing that, I was baking up some Soft gingersnap cookies, and some no bake cookies the we around here call Mud Pie cookies. I also made up another batch of dough for more of the soft gingersnaps, since they need to be refrigerated over night, and they are soooooooo good. I can see the first batch being gone in no time at all. And best of all today, our son Noel is coming home today, and he'll be here for 5 weeks. That's not great for his pocket book, but it's wonderful for this mom to have him around for a bit. So, I'm going to link up to Judy's On the Needles, and then get back to the baking. More ginger snaps without the snap, some coconut macaroons, and maybe some chocolate chip cookies too. I'll see how the day goes. I used a little bit this week, doing the place mat for the guild that were given to Meals on wheels. I did up 2 place mats, one for the colour challenge, and then another out of an orphan block. I forgot to take a picture of the second one, but here's the first one, for the colour challenge. It used more fabric than it should have, due to errors in judgement for the size of the pieces required for the paper piecing. I ended up just using over sized strips of fabric to do the piecing, which caused quite a bit of waste. And I have to add in the remains of a bolt of Kona cotton I ordered. Some of the bolt went to other people, but 15 yards of it has remained here. But, the good side is, I have plans for that Kona cotton. It is Kona Ash, and will work as a background for a couple of quilts I want to do in the near future. I'm linking up to Judy's Stash Report, then I think I'll knit for a while, after I read the other reports that are posted there. Vicki Welsh, over at Field Trips in fiber is doing a Real Studio Tour. Last week, we showed non sewing tools that we use for sewing. This week we are showing our storage solutions. I have a couple of different ones. When we moved last spring, the worst part of it had to be figuring out what to do with all the fabric. My studio went from being all in one room, to now being in 2 rooms. My sewing area is down in our apartment. I had to figure out some way of at least semi-organizing the fabrics so I could see them, but that wouldn't look too messy. 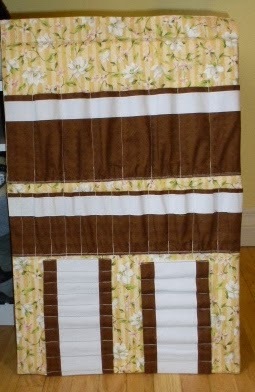 I saw an idea, originally using comic book boards to wrap fabric around, so that the fabric would stand up on the shelf. Now, if this were a show room studio, or a magazine studio, these shelves would be pristine, and tidy, all lined up even with the edges, without power cords from the light box hanging down from the shelf on top. My other storage solution involves my unquilted tops, and any customer tops that are waiting to be done. We took some 2x4's and attached them to the end wall in my long arm studio, taking care to find the studs in the wall to attach them to so they could bear some weight. 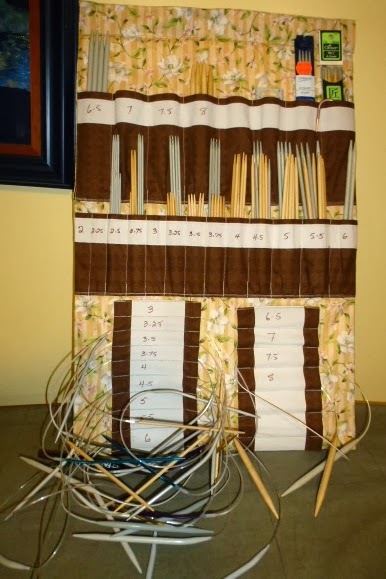 Then, we got some ordinary coat hooks and attached them to the 2x4's some wood dowels complete the system, for the quilts to drape over, and hang as they wait their turn. 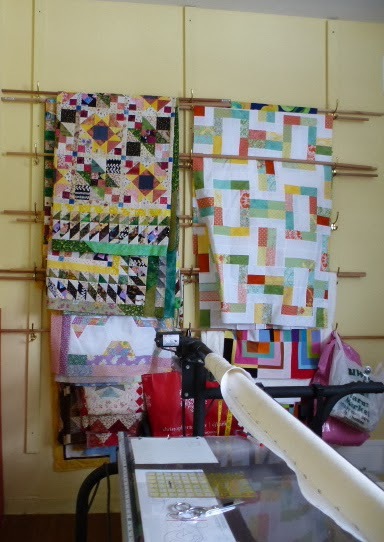 Almost all of the quilts hanging in this picture are mine, waiting to be quilted. I'm linking up to Vicki's blog for this week's studio showing. I have a couple of finishes. The place mat for the colour challenge was handed in at the guild meeting on Thursday, so I can now show that project. 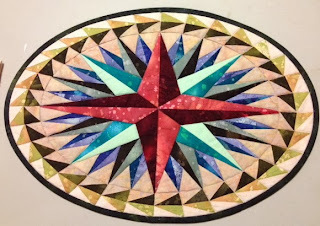 I used a Mariner's compass pattern out of Electric quilt, but I told the program to make it 14x20. Then I left off the background areas that would have made this into the rectangle, and left it in the oval shape. This is going to the Meals on Wheels people in our city, who will use this as a decoration for someone who will receive their Christmas dinner from Meals on Wheels this year. And I can also now show Road to Brenham. I'm going to attempt a picture out in the snow. It still has to be washed and dried before it goes to its forever home at the wedding the weekend, so if it gets damp or a little wet, it won't matter. I started writing this post, yesterday, which was Friday, expecting to go to the wedding today. Well, it is winter, and plans get changed along with the weather. There is a snow storm today both here, and in the city where the wedding is happening. The roads are awful, with lots of cars in lots of ditches. So, we're not going to be able to make it. :( We'll stay at home and wish them well from here. I'm going to link up to Finish it Friday even if it is Saturday. have a wedding to go to tomorrow, a 2 or 3 hour drive away, so I'll work on this in the car, providing the winter storm that is predicted doesn't prevent us from going. I'll be using this yarn for the cowlie. It's a worsted weight superwash from Berroco, but I threw away the labels when I wound it into the balls, so I don't know exactly what yarn it is. Maybe that wasn't such a good idea. I'm linking up to On the Needles. It's always fun, and sometimes dangerous, to see what others are working on. My favourites list of patterns just keeps getting longer and longer. But it sure is fun. Not much in the used department this week, but none coming in, either, so I suppose that's good news?!? I exercised mega restraint and deleted all ads that came into my email pretty much as soon as they appeared. Now, I know I can always go to the web site and look at the sales that I know are there. But, somehow, it's more tempting to do it from the emails. I'm working on my colour challenge for the guild. I've been working on it all afternoon and am only1/4 done, and seriously questioning my sanity. What I thought would be a good idea several months ago, now has me asking myself what was I thinking? Especially since it's for a placemat for Meals on Wheels, so it's going to be given away. That tool that I blogged about here has been getting a lot of exercise. Ah well, all for a good cause, and it is going to be very nice when it is done. Balance. 41.5 more yards in than out. I'm linking up to Judy's Stash Report and then it just might be time to find something to eat before I see if I can get to 1/2 done for the colour challenge. Oh, did I mention it's due this coming Thursday? re- purposed sewing tool.Well, actually, it was yesterday's assignment, but I'm late, as usual. I didn't even have to think about this one. It is something I have beside me all the time when I am sewing just in case of oopsies. This is my super dooper, handy dandy, battery powered seam ripper. Also known by its more mundane name of mustache trimmer by Conair, found at Walmart for the whopping price of about $10.00. It might be more than that now. I've had this one for a large number of years. It uses one AA battery, and is the best money I ever spent for a seam ripper. It's quite simple to use. Simply gently pull the pieces that need to be ripped apart open so that the seam threads are visible. Then just lightly touch the blade end of the trimmer to the threads that you want to cut. If you use the tool to go along the seam and nudge it open with the blade, it is literally done in seconds. The actual moving cutting parts are set far enough back that it will cut the threads, much like it would cut hair, but it won't cut the fabric. It is so much easier than the old version that requires the insertion of a sharp point into a seam to cut the individual thread one at a time. There are quite a few more non-traditional tools to be found at Vicki's. of writing this now, at 10:48 pm. First thing this morning, well, first thing for me, at least, which is everyone else's end of the morning. Anyway, first thing, we went out shopping. We had some stuff we wanted to pick up for all the grand kids, and we did well, and found most of what we were looking for without having to drive all over the place. One store did it, actually. The driving around all over the place occurred when I said that I wanted to go to the sewing machine store to get some replacement needles for my sewing machine. The store is on the other side of the city, but we're really close to the highway here, so it's a fairly quick trip over there, unless, of course, the person who is driving, not me, takes the wrong exit and ends up going in the wrong direction. It meant I got a lot more done on the sock that's showing here, but I never did get those needles. When we got home, it was time to mix up some ginger bread cookie dough, roll it out and make some ginger bread men cookies. We're all going to decorate them tomorrow, and put them on the Christmas tree, which I think we are doing tomorrow, as well. Then, I got the Road to Brenham quilt bound. I do it all by machine, so it only took a couple of hours, The binding was already made. And after that, I got all of the colour challenge stuff for the guild organized and my project started. Considering the colour challenge project is due on Thursday, and that I want to take the quilt to the guild meeting for show and tell, it was way past time to get these things done. In the midst of all this, I've been knitting. That is the third hat I've gotten out of this yarn. I originally ordered it to make Noel, our son, a hat and a scarf, and maybe some gloves, but I didn't really know how much of the yarn to order. Obviously, I ended up with way more than I needed, so I think the other guys in the family might be getting hats, too. I tried the gloves a couple of times, and couldn't get them to work. And then I started to think that maybe gloves made out of alpaca yarn that have to do things like clean off cars might not be such a good plan. So the gloves idea got scrapped. And then, just because I felt like it, and I needed something portable for car trips, and stuff, I started another pair of socks. This is Alpaca Sox yarn from Classic Elite Yarns. It has got to be some of the softest yarn I have ever felt. It's 60% alpaca, 20% merino wool and 20% nylon. I bought 2 skeins of this yellow and turquoise colour, and 2 skeins of a light blue, as well. These are going to feel so good on the feet. I'm finding that the more of these socks I do, the faster I'm getting at it, too. I just started these 3 days ago, and just pick them up whenever I have a minute or two, or when going out in the car. I even took them out to work on in the restaurant the other day, while we were waiting for our lunch. So, this was our day, very long, and busy, and wonderful. I'm linking up with Judy's On the Needles. Then I need to take my medications, and maybe knit a bit more before bed. I was reading in my devotional that comes into my email every morning, and a challenge it gave caught my eye and my heart. I was just going to pass it by, and go onto something else, so much else that I have to do, especially at this time of year. But then, it caught me again, and said to me, do it, don't just briefly think about it and then forget it. Do it! "Take some time to write down five ordinary things that you appreciate. 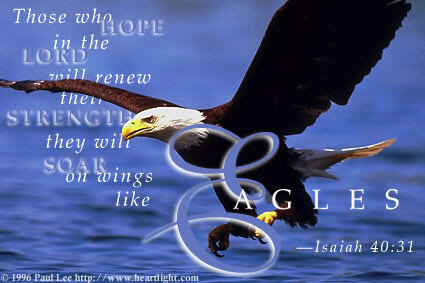 Then, list reasons why these ordinary things are actually special blessings from the Lord." I'm sitting here in my recliner, looking out the window, and the first"ordinary" thing I see is trees. Trees that give us shade in the summer. Trees that give us food and so many creatures shelter. Trees that create the forests where I love to spend time in the spring and summer and fall. Trees, and the sound of the wind in their branches and the sound of rain on the leaves. Trees, that even in the winter, have beauty, as their bare dark branches provide patterns across the sky. The next "ordinary" thing I see and think of is this home. It's a home made of bricks and mortar and wood, but it is so much more. It is a home full of the people I love, each giving to each other. It is a home full of the love of God being worked out in all our lives. How glorious is that! Fabric, another "ordinary" thing, and yet it is full of colour and possibilities. Fabric fuels my creativity, which is surely God given. Fabric clothes us, keeps us warm, and is an outlet to express the love to others that I feel inside, but sometimes have such a hard time expressing. And then I look at our coat rack, and the "ordinary" garments hanging there. I count six or seven different coats and sweaters hanging there. and then I think of the closet, full of our clothing. It's not fancy, it's not the latest style or trend, and yet without all of it, we would not be able to live. We would freeze in the winter. And yet God graciously provides all our needs, like the lilies of the field. And the other "ordinary" thing that has such a prominent place in what I can see from where I am sitting is books. Books that are just ordinary fiction, read for entertainment and escape. Books full of God's word. Books, written by men and women, who wish to glorify God through their writing, who wish to dig deeply into God's word, and bring it to life, to take a passage of scripture and dig deeply into it for all that God has to say and teach His people. Five "ordinary" things, that are such great gifts from the Lord our provider. Thank you Lord! My design wall looks exactly the same as it did last week. I had hoped to have a lot more done on this by now, but other things, like the pre-Christmas quilting rush, both my own and other peoples' has kinda taken priority. Maybe by the end of the year. it will get done. This is a pattern named Thanksgiving, from Judy Martin's book Patchwork Among Friends, which I just noticed is on sale for $9.95, by the way, if you are at all interested in her designs. I don't have any affiliation, other than a very satisfied customer. This is the third quilt I've made from this book. It was well worth it at full price, so this is a steal. As far as the rest of my time goes, I've been making lists. Things that I need to get done now, and in the next few weeks. And then I've been thinking about next year, and what I'd like to get accomplished. I have listed some of my UFO's, the ones that came immediately to mind, and there are 10 of them. I'm sure there are more buried somewhere, but I have 10 I'd like to work on. And then there are some new projects that I'd like to start next year. At some point, I'll be updating some lists in my right side bar, showing these lists I'm making. In the meantime, I'm going to link up to Design wall Monday, and then see if I can't get more things on my list crossed off. I used up a bit more fabric this week making a couple of pillow cases to go with the Road to Brenham quilt I did this past summer. Past that, nothing else has been used. I'm still working on finishes, so no new usage is happening. I guess that's the down side to counting stash used as it's cut, rather than waiting until the project is finished. However, if I waited to count until something is finished, some things would never get counted. Although, maybe that would be incentive to actually start and finish a project, before starting something else........... nah, not gonna happen in my world. Although, I think I'm doing really well considering, other than the scrappy Saturday challenge, I haven't started a new project in months, since Road to Brenham, I think. That is going to change, though. I am planning on celebrating the starting of the New Year on January 1st, by starting a new project. I just decided that now. I think I'll go through my books, and find a project that I love, and start it then. New year, new project, I think I like that. Anybody else want to join me on that? I haven't bought any new fabric in 6 weeks, and haven't any plans on buying any before the end of the year, budget constraints are dictating that. It's time to start dipping into those fabric retirement savings I built up over the last few years. So if I start a new project at the beginning of the year, I'll start the year with a fabric out balance, rather than the other way around. Balance: 42 more yards in than out. Back when I was participating in a UFO challenge, where we would list them by numbers, and choose a different one to work on each month, I used to work on current projects for the first part of the month, and the UFO project for the last half of the month. I might go back to doing that. I really like the feeling of getting something finished, but I miss the excitement of starting something new. I'll have to think about that some more. I'm linking up to Judy's Stash Report, and then I think I'll sew some more leaves for the Thanksgiving quilt, which hasn't seen a whole lot of progress in the last week.